Designed by Shabnam Gupta and Images released by Architectural Digest. Irrfan Khan is one of the finest actors we have today in our Hindi cinema. From pulling off a Madaari to piku, he has never disappointed us with his roles and versatility. But what makes him positive and creative? There are many sources from which he draws creativity, but according to khan, his house is the best source for his powerful performances and creative mind. So, let's bump into his house to broke the code of creativity! 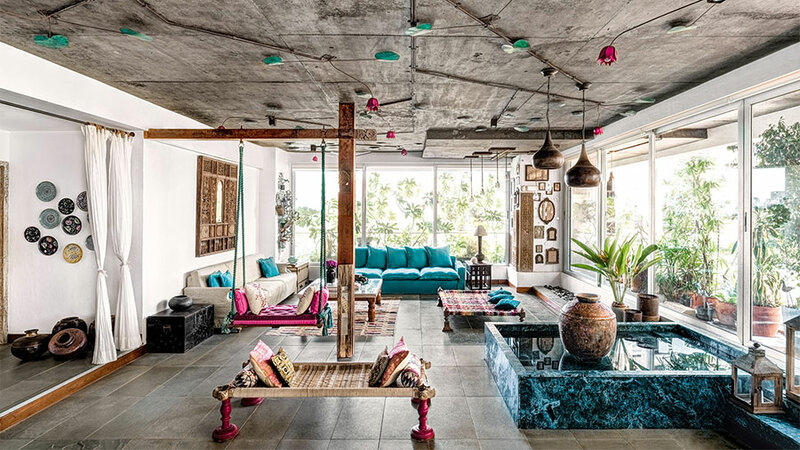 The interesting thing about Irrfan Khan’s house is that it is a perfect blend of Indian artwork and Modern aesthetics. From small knick-knacks to wall arts, every small thing in the house nurtures his creativity. 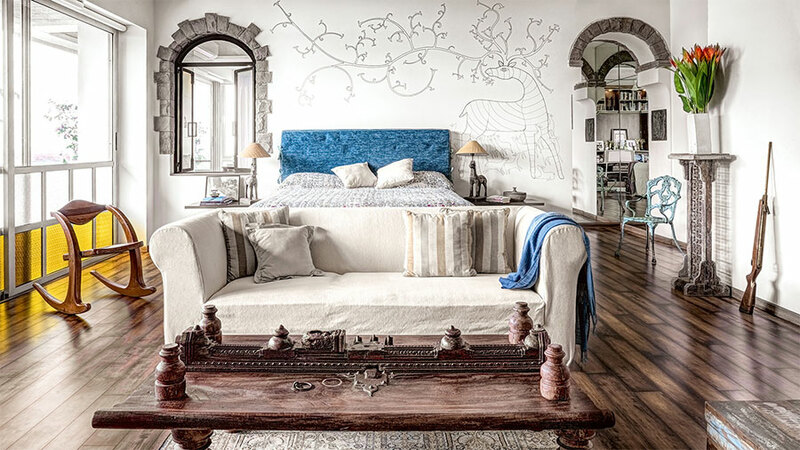 Irrfan Khan’s house is engrossed with travel-finds like paintings, floral motifs, mirrors and decorative lights. The khan’s home is a stand out as it brings out the beautiful combination of Indian furniture with the modern layout. 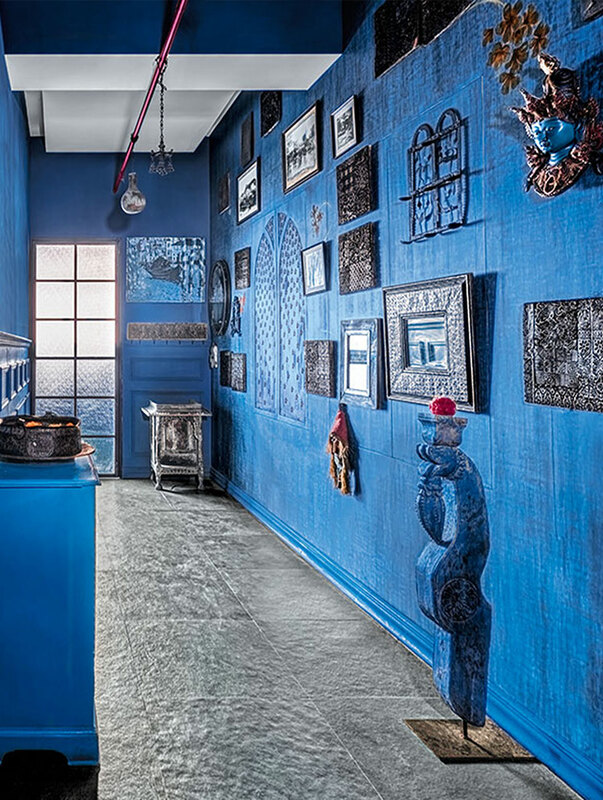 Irrfan Khan’s house opens to an alluring blue dreamy foyer. This beautiful entrance is colonized with art sculptures, floral motifs, frames and what not. It's magical to have such entrance on which you cannot stop drooling over. The five-floor apartment has an enchanting living room which is vivacious and vibrant in colors. The first thing which grabs my attention is the swing and traditional bench from which I couldn’t take my eyes off. Another mesmerizing thing about the living room is that it is completely drowned with natural lights; the ceiling has a floral light installation which is a cherry on the cake. The corner pillar of this living room is fully accessorized with the mirrors of different size and shapes. And, also with the terracotta panels which gives the unique character to the living room. Khan confessed that he is obsessed with mirrors which we further encountered in his dining room. 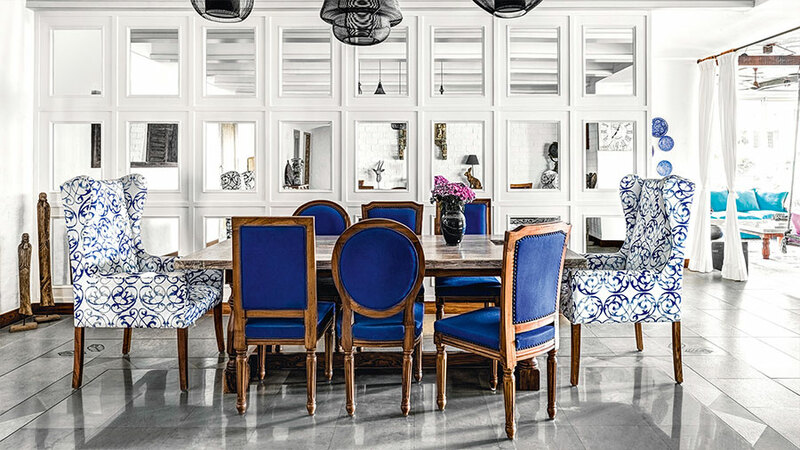 This area is more to the elegant and formal side with the hue of blue and white color. There are lots of warmth and calming vibes and the reason behind it is again the natural lights kissing his room. Irrfan’s bedroom is his serene space. Both the husband and wife have immense love and passion for creativity and art. The point of convergence in his bedroom is the gond drawing on the white wall. On the other side, there is a window through which he gets the view of his private study. The huge library, comfortable seating and wing chair was creating the perfect nook at the time of reading his scripts to books. 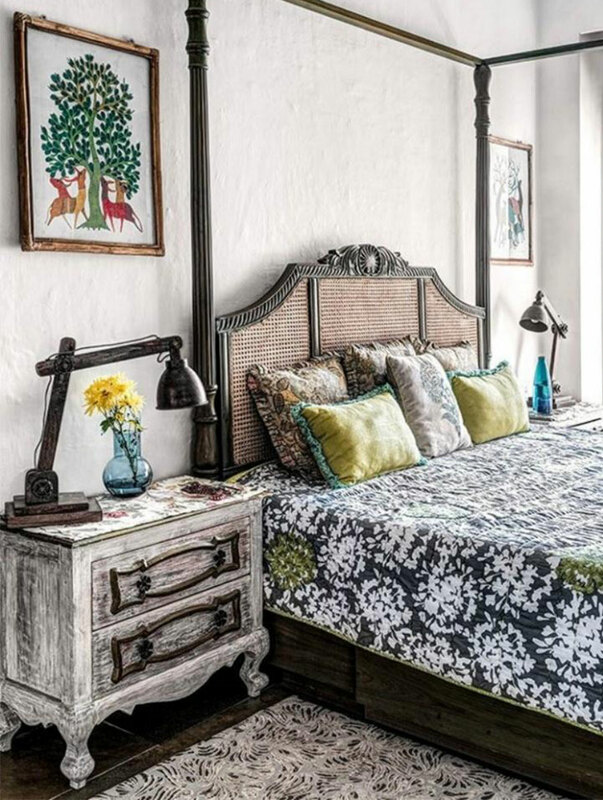 Stupa’s bedroom is the perfect blend of rustic charm with Indian artwork as she is more inclined towards old and vintage art. 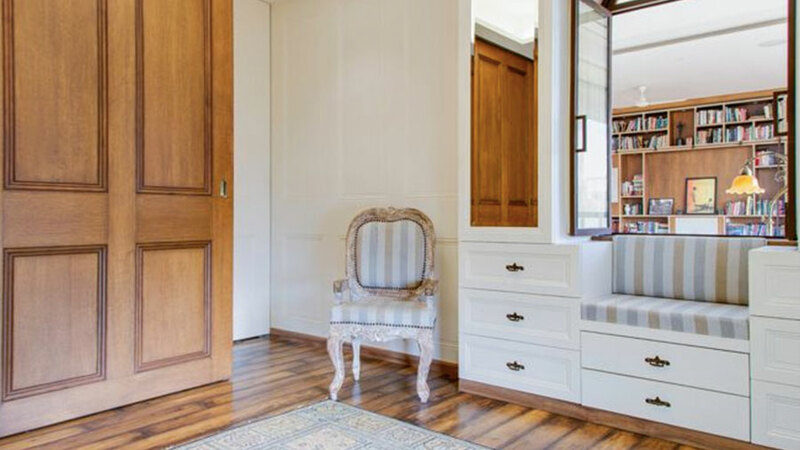 From giant mirror to the chair to the wall art to the lamps on bedside is gorgeously stacked. According to the Designer Shabnam Gupta, it is her most challenging and creative project ever which is executed satisfactorily and uniquely. 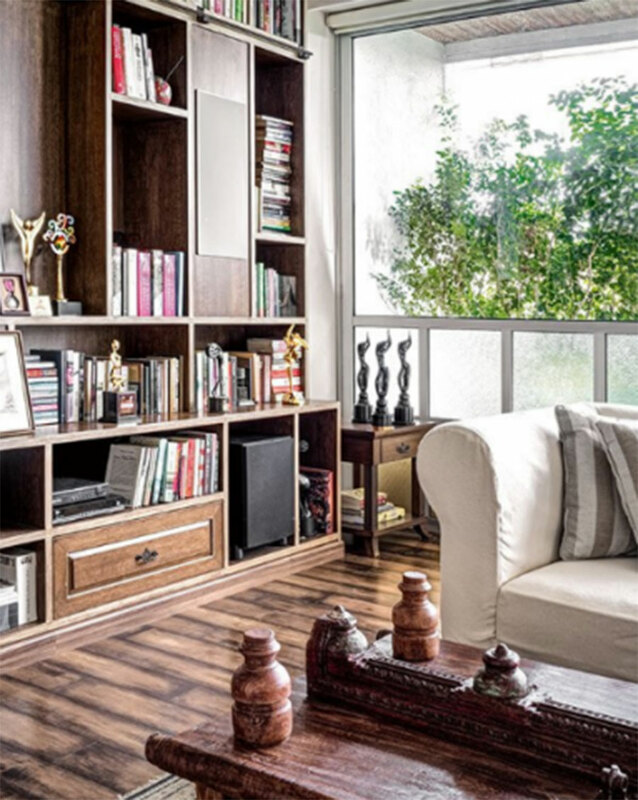 Home is the place which can inspire us to be creative, motivated and be unpretentious towards our loved ones and work, and the same thing we can take from this famous Bollywood actor’s house. P.S: Not to miss a unique punch of small elements like terracotta panels, mirrors and jhula to add to your house.